Saving you time, money and frustration. Permanent Makeup can make your eyes brighter, and lashes look fuller with eyeliner application. With full lip color, lips can look fuller and more defined, bringing out your own lip color, but brighter, often replacing filler injectables. Brows can look realistic with hair strokes and creating dimension instead of a flat stenciled look. Permanent makeup can also restore areola color due to breast surgery or symmetry, camouflage scars, fill in areas of vitiligo, and even correct “bad” Permanent Makeup Application. Yes! Permanent Makeup can indeed enhance the quality of ones life, saving you time, and money. Not only making you look better 24 hours a day but also feeling better about yourself 24 hours a day knowing your makeup wont wear off, cry off, swim off or sweat off. A Beautiful Investment In Yourself. At Skin Oasis Institute we offer a highly specialized procedure known as scalp pigmentation. 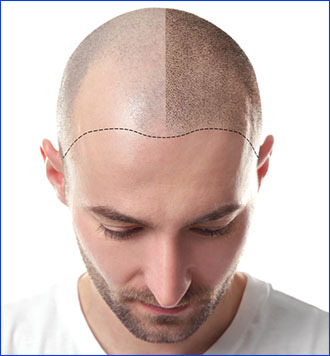 It is the artistic approach of implanting color into areas of thinning hair or barren areas of the scalp due to hair loss, alopecia, or linear hair transplant scars. dimensional look Jacquelina is able to create the most realistic result. All permanent makeup application, regardless of the Hand or Machine technique, will fade 20% to 40% of its original color application appointment requiring additional follow up appointments scheduled 2-3 weeks apart. Generally eye-liner and brows take 2 applications, however lips take up to 3 applications spread out 4 weeks apart. Color selection, desired look and skin tone will determine the number of applications needed to achieve your desired result. Individual brow hair strokes are created, delivering the most natural dimensional brow. Never a stamped, or magic marker look The best rule in Permanent makeup application is “less is best” It is always easier to add color than it is to remove it. Typically 3 to 5 years is the average time before touchups are needed. Touchups are dependent upon factors such as lighter colors and skin tones tend to fade quicker than darker color and darker skin tones. Also the use of a sunblock will help to preserve your permanent makeup, as well keeping acidic skin products away from the area. within the allocated time frame to insure color stability, longevity and your desired result. With the Softap® technique, the application of implanting color into the is done by hand, no electrical devices. A set of several fine needles are dipped into the chosen pigment color and then implanted into the skin according to the desired shape and design that is most appealing to the individuals skin tone. Every client/patient is very involved with the color selection and design, seeing and approving before any color is implanted into the skin, assuring their desired results. The chosen pigment is deposited by the needles in the hand instrument softly tapping, gently lifting the skin, depositing color in the upper layer of the dermis skin. Traditional methods of implanting color use a reciprocating needle device that pushes color into the lower dermis layer of the skin, causing unwanted, unnecessary discomfort. The Softap® technique gently lifts the skin to deposit color. As a result there is a definite difference in the amount of discomfort. The hand method is far gentler, faster healing, no scabbing or bruising. Most clients can go out to dinner, return to work, or run errands immediately after their procedure. The Softap® pigment colors have earned an excellent reputation because they look so natural. They are hypoallergenic and stay true to the selected color. Many people who have had the Softap® colors and technique said that their friends and family were surprised to hear that they had a permanent cosmetic procedure. Simply said the hand method technique is the most gentle, the most comfortable and the most natural technique for permanent cosmetic application. Individual fine hairs can be easily and artistically designed for the brow procedure creating a dimensional look, not a fake stenciled look. Lips can be made to look fuller and sexier. The eye liner can make the lashes appear longer, darker and their natural eye color brighter. The Softap® technique is safe, precise, comfortable and the most natural looking, delivering the most beautiful results. The Softap® pigments contain safe inorganic ingredients resulting in no allergic reactions. In addition, all items used in the procedure are 100% disposable eliminating the risk of cross contamination between individuals.